Microbial science illuminates a world of astounding diversity. Courtesy of Eurelios/Photo Researchers, Inc.
At the bottom of the sea, life for these giant tubeworms is made possible by symbiotic bacteria that convert chemicals ejected from hydrothermal vents into food, in a process called chemosynthesis. Copernicus, Kepler, Galileo, Newton—these are familiar names. During a 150-year span in the sixteenth and seventeenth centuries, they led the scientific revolution that placed the sun, rather than the earth, at the center of things astronomical. But have you ever heard of Carl Woese? He set in motion a scientific revolution in biology that, in its repudiation of anthropocentric views of life, is proving no less profound. In 1977, Woese (pronounced “woes”), a professor at the University of Illinois at Urbana-Champaign, drew a terrestrial family tree that showed the genetic relatedness of all living things on this planet. Using modern tools of molecular biology, he sampled the known single-celled, microscopic organisms we call microbes, and also the denizens of the human-scale world with which we are familiar: the flowers, trees, and shrubs; the animals; and the fungi. His map of all this new information revealed that taxonomists of ages past had been looking at the world through the wrong end of a telescope. The formerly great “kingdoms” of Plantae, Animalia, and Fungi almost disappeared, shrinking to fit on a small, trifurcating branch of his tree. In their place were three vast “domains”: Bacteria (single-celled microorganisms that lack a distinct nucleus and organelles); Archaea, or Archaebacteria (similar in appearance and simplicity to bacteria, but with notably different molecular organization); and Eukarya (all organisms whose cells have a distinct nucleus—or, simply put, everything else). Life on Earth, Woese’s model showed, is overwhelmingly microbial. In fact, the extent of microbial diversity is so great that scientists have difficulties estimating its actual size. Some estimates place the number of microbial species in the range of billions, exceeding the number of species of “large” organisms by several orders of magnitude. In light of this new understanding of life, scientists with advanced research tools are focusing anew on microbes, which, following the great discoveries of penicillin and other antibiotics in the mid twentieth century, had largely been consigned to the confines of pharmaceutical research. “Our planet has been shaped by an invisible world,” says Roberto Kolter, a professor of microbiology and molecular genetics at Harvard Medical School (HMS). He and Jeffrey professor of biology Colleen Cavanaugh of the Faculty of Arts and Sciences (FAS) together co-direct Harvard’s Microbial Sciences Initiative, which serves as a focal point for researchers in the field from all over the University. “Microbes mediate all the important element cycles on Earth, and have played a defining role in the development of the planet,” says Kolter. They form clouds, break down rocks, deposit minerals, fertilize plants, condition soils, and clean up toxic waste. Among their ranks, explains Cavanaugh, are the photosynthetic “primary producers” that use sunlight, water, and carbon dioxide to form the broad base of the food chain, and together with plants make up the earth’s largest source of biomass. The earliest life on our planet was entirely microbial, and if life exists on other planets, it is surely microbial there as well. From the billions of bacteria in a soil sample, these few cells landed on a nutrient medium where they could grow and form colonies. “There is so much beauty everywhere we look,” says microbiologist Roberto Kolter. A strain of Streptomyces that produces several antibiotics widely used in medicine and agriculture. When starved, these bacteria take on a “hairy” appearance as they initiate growth of aerial structures where protective spores develop. The pigmented areas consist of small molecules, often with antibiotic properties. In the presence of the antibiotic streptomycin, colorful antibiotic-resistant mutants of Streptomyces coelicolor spring up and form colonies. In the realm of human health, microbes help us digest food and produce vitamins, protect us against infection, and are the main source of antibiotic medicines. The human cells in your body number 10 trillion, but that pales by comparison to the estimated 100 trillion microbial cells that live in and on you. “Without them, you would be in trouble,” Kolter says: animals experience abnormal growth and become sick if deprived of their microflora during development. Although a few microbes are known to cause disease, the precise role played by the vast majority is essentially unknown. The same could be said for microbes around the planet. There are a billion of them in a gram of soil, and a billion per liter of seawater, but we know neither what they are nor what they do. As a practical matter, the Microbial Sciences Initiative (MSI) began in 2002 as a grass-roots effort among faculty members who recognized the unexplored ecology and potential of these organisms and wanted to share information about microbial research across diverse disciplines: biology, medicine, chemistry, engineering, geology, astronomy, and evolutionary and planetary history. The group held informal “chalk-talks” weekly, and in 2004 staged a day-long symposium with speakers from around the world. When President Lawrence H. Summers issued a call that year for initiatives that would bring people together from across the science and engineering disciplines, MSI was a perfect candidate, says Cabot professor of biology Richard Losick, a member of its steering committee. “I think there are few disciplines that lend themselves better to cross-disciplinary approaches,” he says, “and few subjects that have implications across a wider spectrum of sciences than is true for microbiology.” As a result, in 2006 MSI received four years of support, totaling $2.7 million, from the provost’s office. Not much can be gleaned about the differences between these two microorganisms just by looking at them, but genetic analysis tells us that they are not even in the same domain. Left: Soil-dwelling Bacillus anthracis is classified as a bacterium. Right: Heat-loving Thermoproteus tenax is an archaean that lives in hot springs. Scientists had known that there are more microbes in an ounce of soil than humans alive on Earth, but that was just a measure of abundance. Pace’s discovery demonstrated something new, a previously unfathomed repository of biodiversity. Scientists began sequencing DNA from all sorts of environments. After looking at human gut microflora, they learned that each individual has his or her own characteristic set of a thousand species. “These represent three million genes that you carry,” points out Kolter, “as compared to the estimated 18,000 genes of the human genome. So you are living and exchanging [metabolites] constantly with a diverse pool of some three million genes.” Microbiologists continue to find new taxonomic divisions of microbes far faster than they can figure out how to culture them. Their cell membranes outlined in red, individual Bacillus subtilis bacteria contain the biosynthetic machinery—shown as green dots—for making bacillaene, a newly discovered small molecule. Colonies formed by the wild strain of Bacillus subtilis generate complex structures, as seen at left, while the domesticated strain—presumably selected for uniformity by generations of researchers who have used it in laboratory experiments for many decades—has lost nearly all colony architecture. 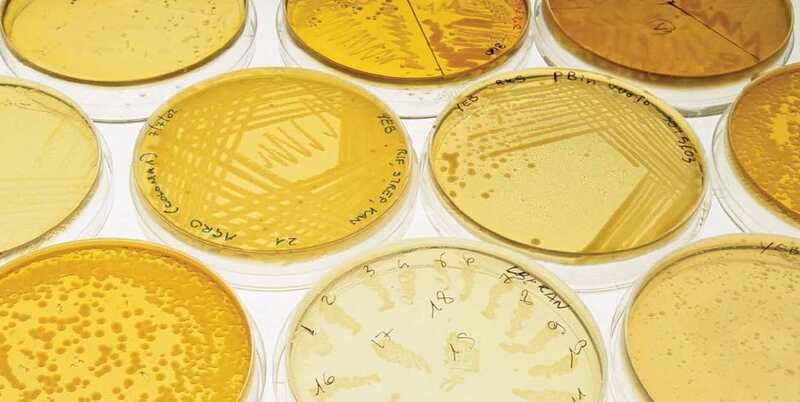 The formerly limited view of the microbial world arose from what has turned out to be an inherently constrained approach to the study of bacteria: the practice of culturing them. For more than a hundred years, scientists had been mystified by what was called the “plate count paradox.” Whenever they tried to grow a sample of bacteria from the environment on a nutrient medium in a petri dish (an agar plate), only a few microorganisms grew and multiplied to form colonies, when there should have been at a minimum thousands of such colonies (based on the number of different species discernible just by looking through a microscope). Various explanations were offered—that 99.9 percent of the bacteria in the sample were dead, or that they must all be the same bacterium because they looked similar. The world of animals—from elephants to ants—is divided into 13 phyla (vertebrates are one phylum, insects another). In the microbial world, their equivalents are called, for the time being, “deep-rooting branches.” In 1987, 13 of these big divisions were known in the bacterial domain: Woese sampled these to create his tree of life. But by 1997, there were almost three times as many: 36 in all. “Twelve of them we had never cultivated, and the others we began to learn how to cultivate,” Kolter explains. “By 2003, there were 53 divisions, but the more we discovered, the more we found representative microbes that we could not cultivate. We learned how to cultivate microbes from only two of these in six years and by 2004 we had found 80 such divisions from which we couldn’t cultivate even a single representative.” Each of these deep-branching divisions is thought to represent millions, if not hundreds of millions, of species. “That means there are lots of genes out there, and we have no clue what they are doing,” Kolter says. “So when you think about biodiversity, and the extent of diversity on the planet, you really get a sense of how little we know about this undiscovered world. We are at the stage of discovery where, everywhere we look, we see new species. Two colonies of Bacillus subtilis growing on top of another bacterium, Streptomyces coelicolor. The Bacillus colonies “talk” to the Streptomyces using small molecules. The strain of Bacillus subtilis at left makes compounds for turning production of a small pigmented molecule in Streptomyces on and off. But in a mutant strain of Bacillus that cannot produce the “off switch,” Streptomyces produces the pigmented red ring. This led to the discovery of the molecule that acts as the off switch: bacillaene. Below, the molecule’s chemical structure. But probing those secrets is far from easy. When grown in a lab in pure culture, microbes apparently don’t need to activate all their genetic machinery to survive. In their natural setting, by contrast, microbes live in a complex ecology: they interact with their environment and with other microbes by using a vast array of virtually unknown small-molecule products. These organic compounds often play multiple roles: a small molecule used for signaling among bacteria engaged in mutually beneficial metabolite exchange (one microbe’s metabolic waste is another’s meal) might also be used to kill competitors trying to gain a foothold in the same ecological niche. Such compounds, if researchers could identify them, produce them, and figure out how they work, might form the next generation of medical antibiotics. Left: The double membranes of Gemmata obscuriglobus may be durable enough to produce “molecular fossils”: traces of early life on Earth that have been preserved for billions of years. Right: Bacillus subtilis forms spores (in green) with lipid membranes that help protect the spore from oxygen damage. These tough cellular membranes appear in the fossil record at about same time Earth’s atmosphere became enriched with oxygen, and may help trace changes in the planet’s early atmosphere. To show that their method works in principle, the team in 2006 published an early discovery using the bacterium Bacillus subtilis, which has been studied for more than 100 years. The compound they identified, bacillaene, may or may not turn out to be useful in medicine, they caution. But it is a highly complex, resource-intensive structure for any single-celled organism to make, and that suggests that it plays an important biological role. Two new MSI postdoctoral fellows arriving at the medical school this year will use the collaborative techniques Kolter and Clardy have developed to facilitate further discoveries. They will enter a universe of seemingly endless therapeutic possibility, between the small-molecule products of bacteria yet undiscovered, and the 90 percent of untapped coding sequences from the bugs we thought we knew. Roseobacteria, which form pinkish colonies, aid in the formation of clouds by producing gases that nucleate water droplets (detail below). “The planet is about 4.5 billion years old,” elaborates another of Pearson’s collaborators, paleontologist Andrew Knoll, Fisher professor of natural history and professor of earth and planetary sciences. “The oldest rocks we can look at are 3.8 billion years old.” Chemical evidence suggests that life was already present then, but certainly “by 3.5 billion years ago there were active microbial communities on the earth’s surface.” These microbes were a little different from those we know today because there was still no oxygen. (Even today, he says, oxygen is just a “veneer on the surface of the planet. If you put your shovel in the mud of a marsh and dig a centimeter beneath the surface you are down to anaerobic microbial ecosystems, which remain critical for most of the biologically important element cycles on the earth’s surface.”) By 2.4 billion years ago, the chemistry of sedimentary rocks suggests that there was “at least a little bit of oxygen in the atmosphere and surface ocean.” Then, “for a period of about eighteen hundred million years, oxygen levels hovered at maybe a couple of percent of today’s levels. Only in the last 600 million years or so do we have environments with enough oxygen to support the biology of large animals, and only in that interval do large animals actually appear,” Knoll says. That is also when the algae first become ecologically important, joining and eventually displacing photosynthetic bacteria as the basis of early food chains in the world’s oceans. “So there is a time coincidence,” he says, “between major events in the history of life and major events in the history of the planet.” Following those threads might also suggest how life could arise, and what it might look like, elsewhere in the universe. Bacteria fertilize plants through the formation of specialized symbiotic “tissues” on the roots, known as “root nodules.” Bacteria in these nodules form “factories” able to capture atmospheric nitrogen gas and convert it into ammonia-containing compounds that the plants can use for growth. By themselves, plants cannot effect this transformation, which is why they need “fixed” nitrogen (not gas) as fertilizer. Photosynthetic cyanobacteria form colorful mats in the warm springs at Yellowstone National Park, a place that plays a central role in microbial-diversity studies. Other kinds of “extremophile” microbes can live without light or oxygen near hydrothermal vent chimneys. The ecosystems around these vents are entirely supported by both the free-living and the symbiotic bacteria. “It is clear that this field will not reach its maturity, in the sense that it becomes less exciting, during my research lifetime or probably the research lifetimes of my students,” Knoll says. “We have whole new horizons in the nature and treatment of disease; whole new horizons in simply understanding the diversity of life as it actually exists—not what we thought existed because we could see it; whole new horizons in the nature of the relationship between organisms and the environment both today and in the future, and on the timescale of the whole development of the planet. These are wonderfully large, exciting questions and MSI gives us a forum to discuss them. You do find, every once in a while, someone who has actually thought about the same problem in a very different way”—and that can be the most important sort of catalyst: the kind that leads to new discoveries.